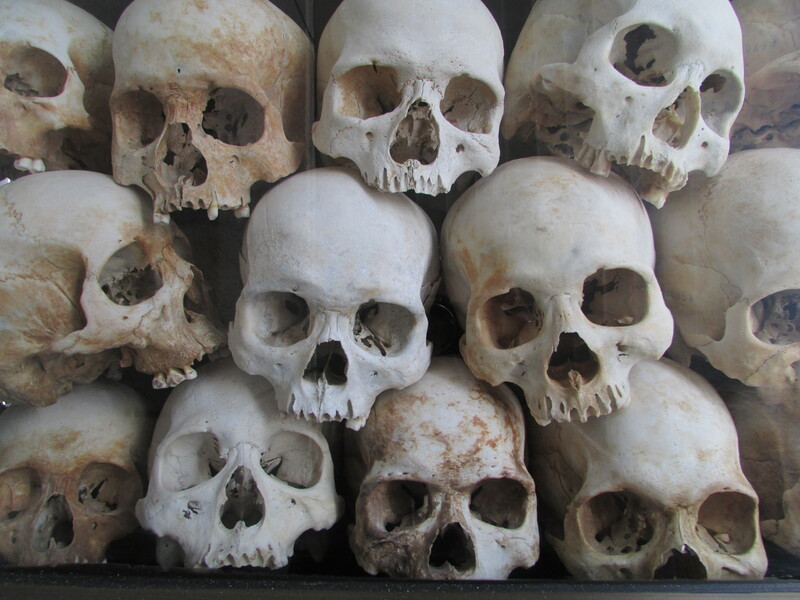 VENEMOUS KHMER ROUGE’S WEB OF HORROR | "MASTERS"
Posted on November 28, 2015 by Mark and Sarah - MASTERS! MY THANKS TO CHRIS D AND CHRIS S FOR THEIR THOUGHTS AND OBSERVATIONS WHICH HAVE GREATLY ASSISTED IN THE COMPILATION OF THIS BLOG, FOLLOWING A DAY WE WILL ALL NEVER EVER FORGET. MARK: Daddy Longlegs – they give me the creeps! They invade the shower at home and walk around the bathroom as if they own the place. I know they can’t hurt me, but I always have to ask Sarah, to “shoo” the thing outside, or down the plug hole. Joe’s the same – it must be something in the Bailey male genes. 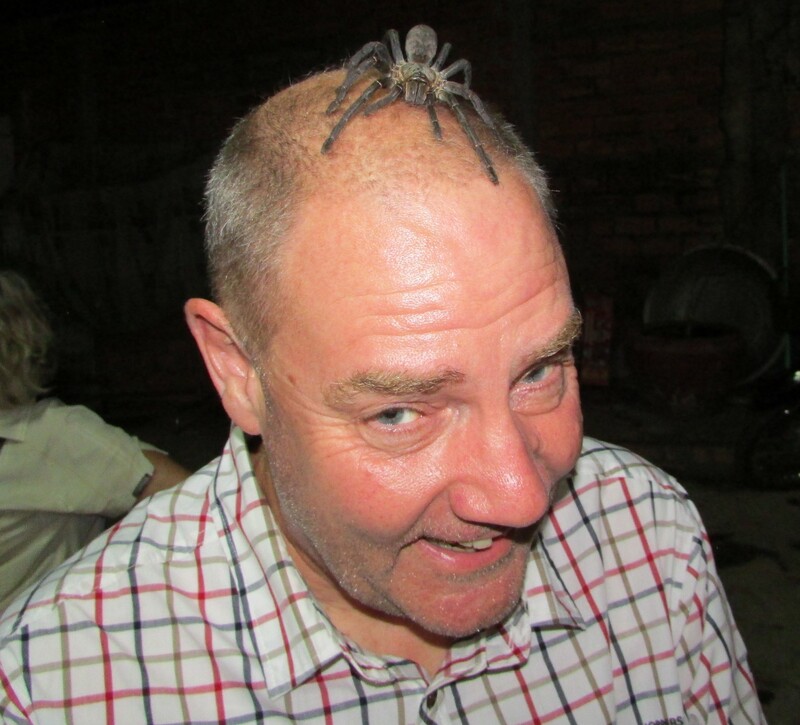 You’d have thought then, that if somebody was to put a big, black hairy spider on my hand or worse still, on my head, I’d be bound to run a mile right? This trip of ours is about discovery, understanding people from other countries, learning about their history and overcoming personal fears. 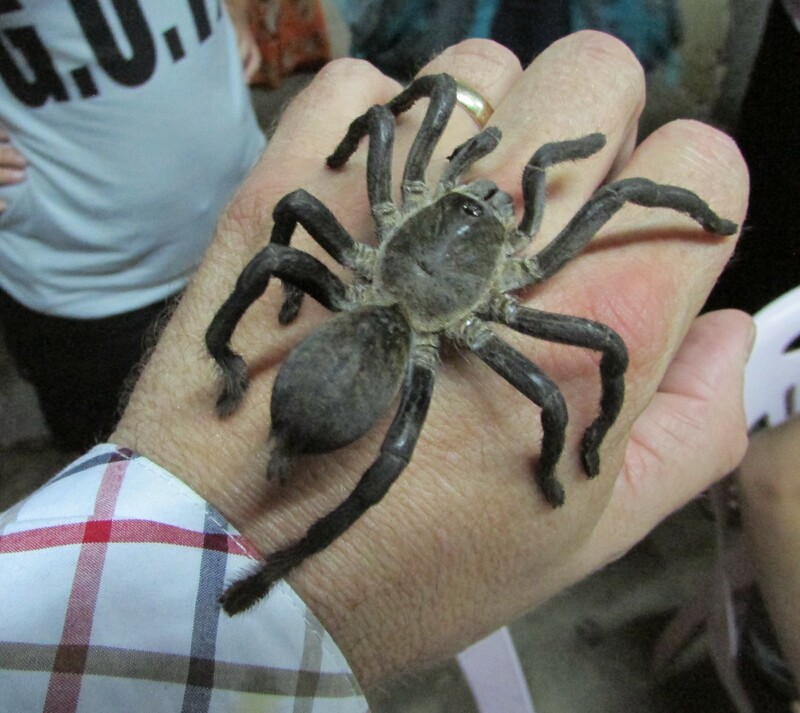 So when Mr Ran said “fancy holding Lulu”, I initially thought he was talking about his dog, not a six inch, fully grown Tarantula! Another fear to banish, I had to do it. … on me ‘ead son! This “opportunity” came at the end of another emotion charged day. 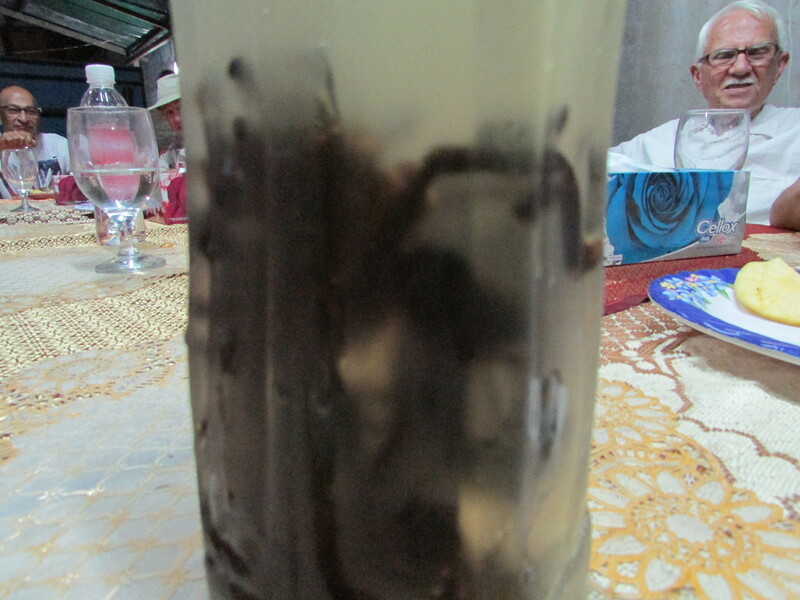 Mr Ran and his family had just finished serving us a Cambodian “family” dinner. Our table of 16 (sadly Sarah stayed in bed at the hotel, still ill after five days), enjoyed beautifully cooked spring rolls, a delicious squid salad, freshly caught fish curry and flavoursome vegetable noodles. And for desert, the freshest juiciest pineapple you have ever tasted! 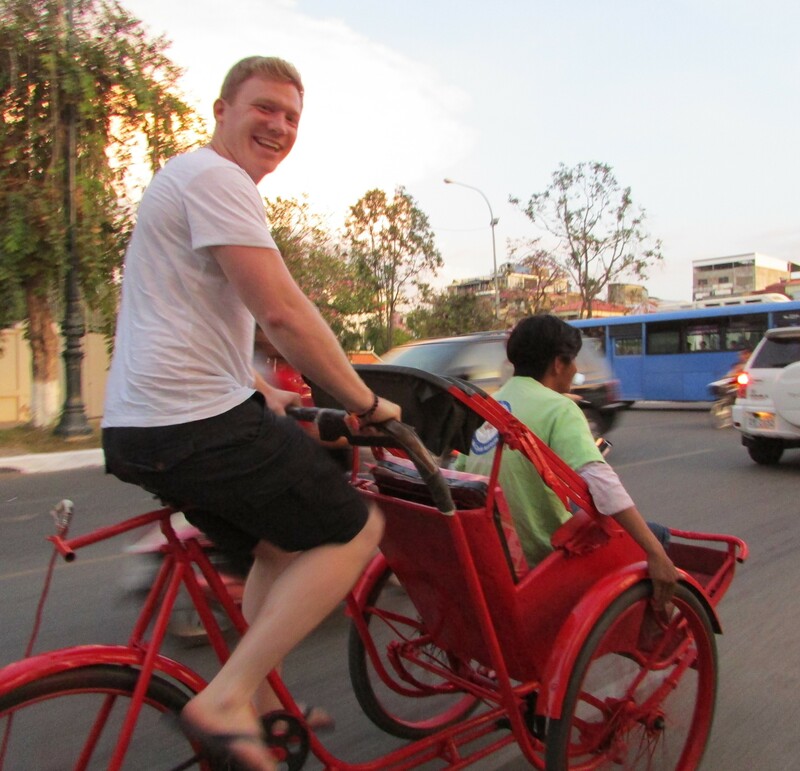 Our $10 (USD) night out included the return Tuk-Tuk journey, dinner and a couple of drinks. But as we learnt, Mr Ran did not pocket the profit. This wonderful man, born in 1970 had lost both his parents and two brothers to the Khmer Rouge in the dark days between 1976 and 1979. 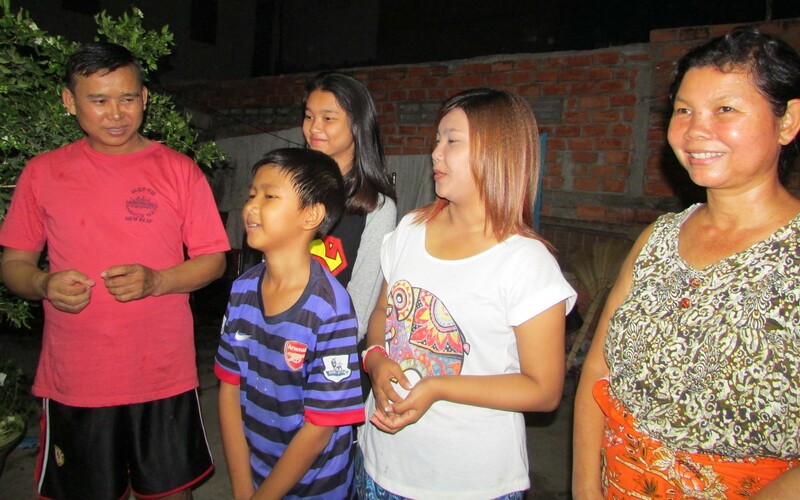 He now lives in five rooms, with his wife’s extended family of 30, having taught himself English from listening to overseas tourists as he drove them on his motorbike around the streets of Phnom Penh. After dinner, he recounted his sad story. How he had survived with very little food during the Civil War – fried Tarantula’s providing a rare source of protein. 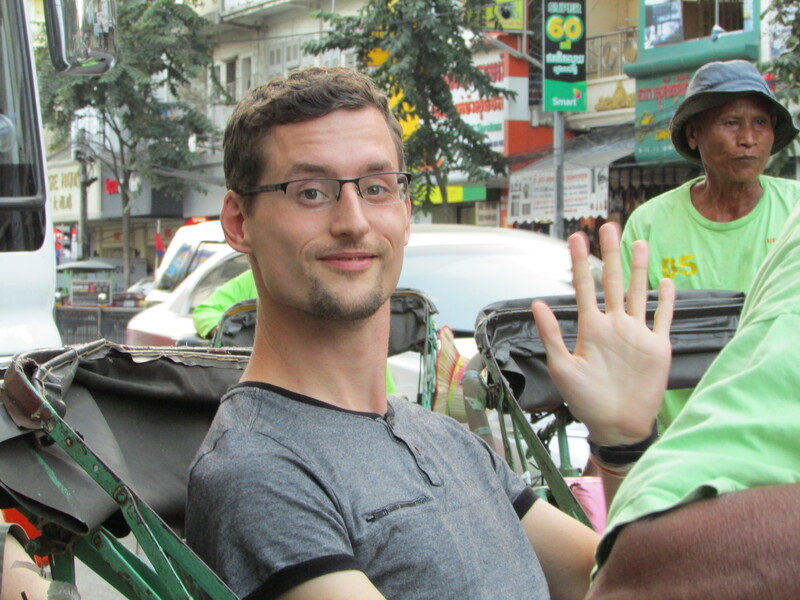 Now as a Tour Guide, he was giving something back using the profits from the Group Dinner to fund the hiring of two teachers twice a week, to teach the local children English. The food we left (there was too much) was given by him to the local community, many of whom worked in the local “clothing sweat shops” where the Chinese factory owners pay around $2 for an eight hour shift. 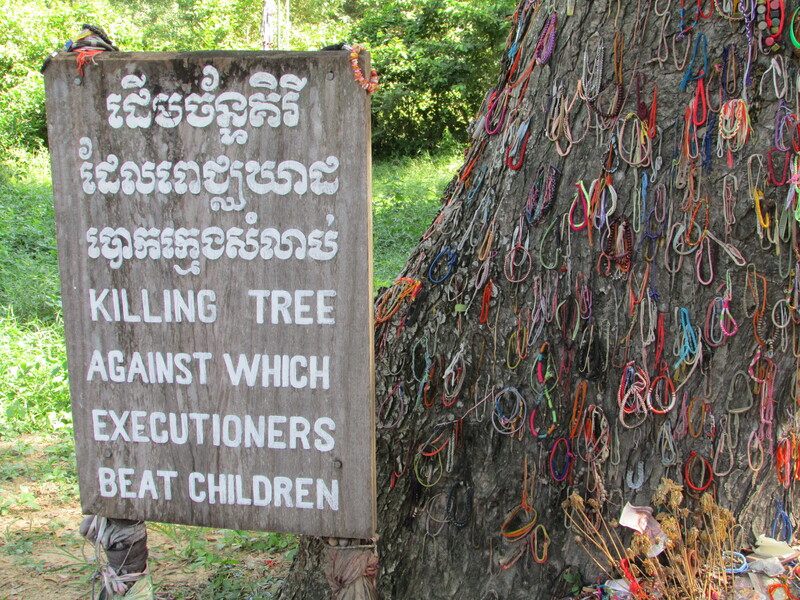 Made in China is now made in Cambodia… Don’t get me started on this particular subject. This saintly man had us all enthralled as he talked quietly and calmly about his neighbours a couple of doors away who were active members of the Khmer Rouge under Pol Pot (his name means Political Potential)! He told us he knew they were murderers and were directly responsible for some of the terrible crimes against humanity. I felt sick! Sick with anger. These people were still walking the streets. They were never brought to justice. 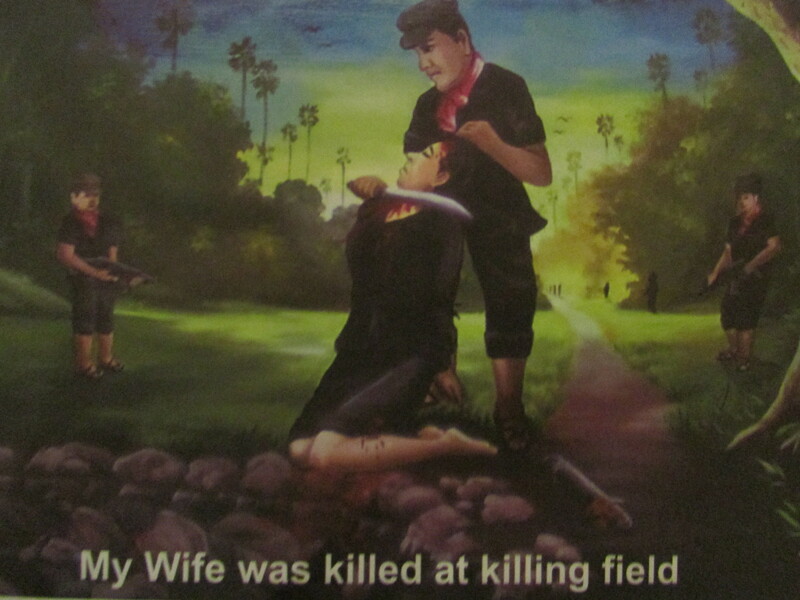 They were barbaric killers, who simply went back to “their day jobs” once Pol Pot’s regime was finally over-thrown. They were living next door for God sake. One of our Group, Chris D asked if he could “forgive” the murderers. Mr Ran answered with great honesty. I paraphrase. “Forgiveness is the wrong word. I accept what happened. If I kill him, then his children will kill my children. What is the point? What would it achieve, there is no point….” Asked if he would invite his “neighbours” round for dinner, Mr Ran firmly said no, “but I would do business with them as we are stronger working together for the country”. 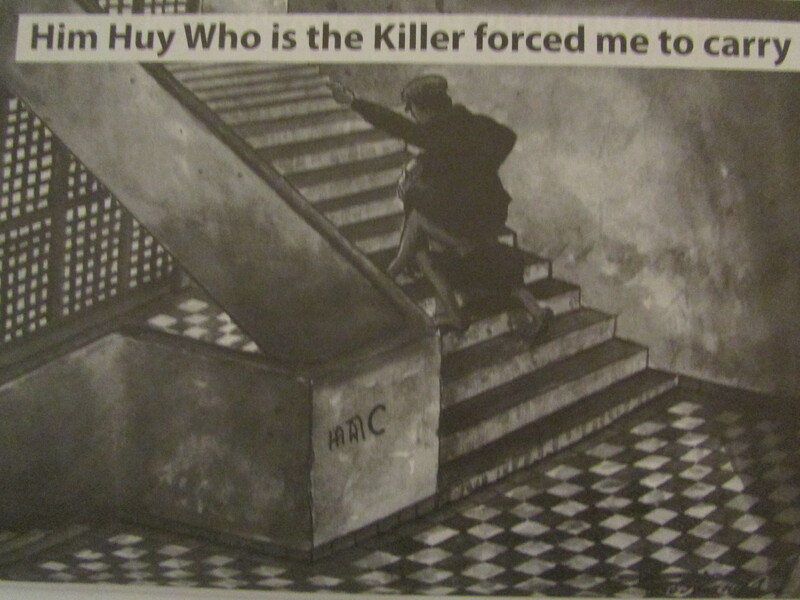 Mr Ran had the heart and the bravery to break the circle of revenge. We toasted him with Tarantula Whiskey poured from what looked like an old Robinson Barley Water bottle, spiders floating in a grey murky liquid. 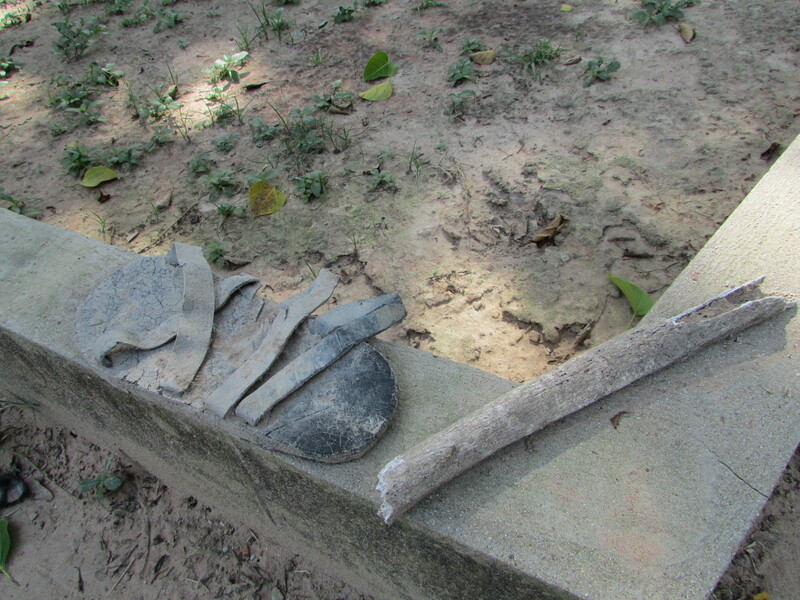 Earlier in the day we had visited two of the main crime scenes of the Khmer Rouge. 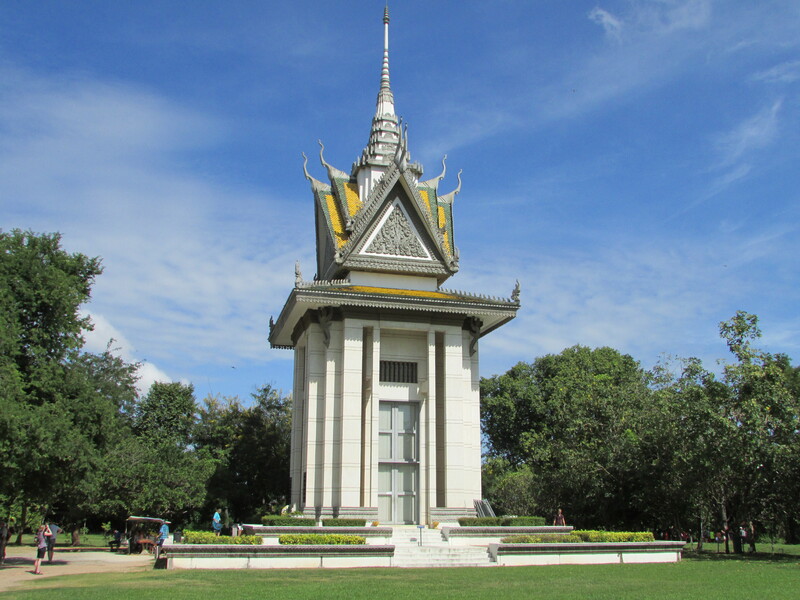 Firstly Cheung Ek, known as the Killing Fields, some 15km from the centre of Phnom Penh and then on to the torture prison called locally S-21. 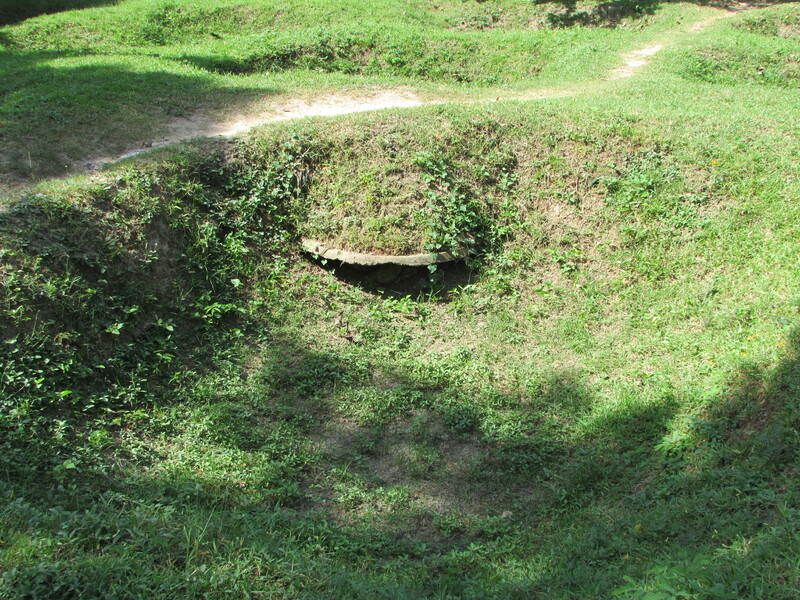 We heard how Cheung Ek was just one of 387 similar sites found in Cambodia – SO FAR. 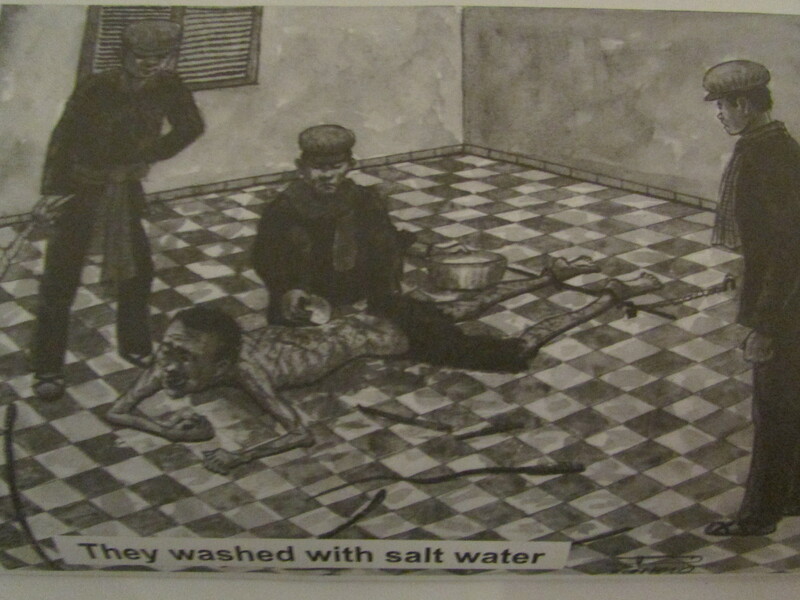 Three million innocent babies, children, women, men brutally wiped from the face of the earth. 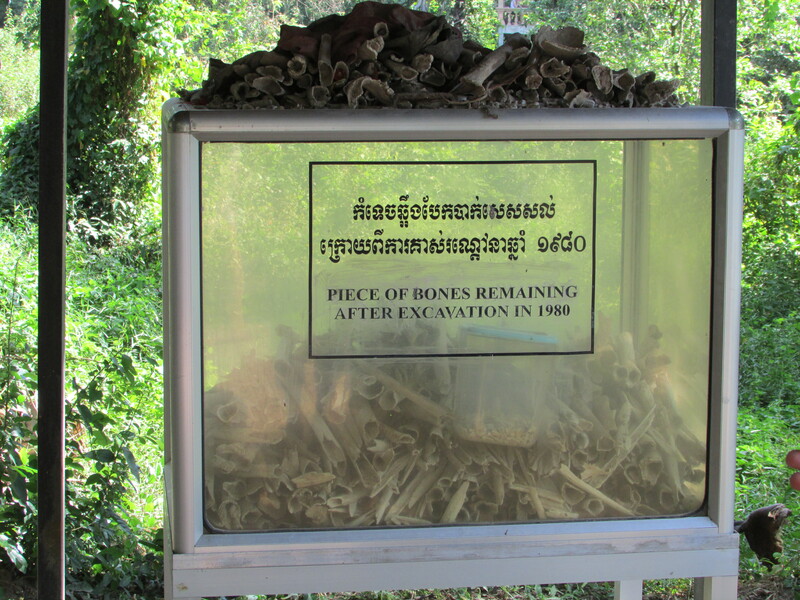 The Killing Fields Memorial, complete with thousands of human skulls was one thing. 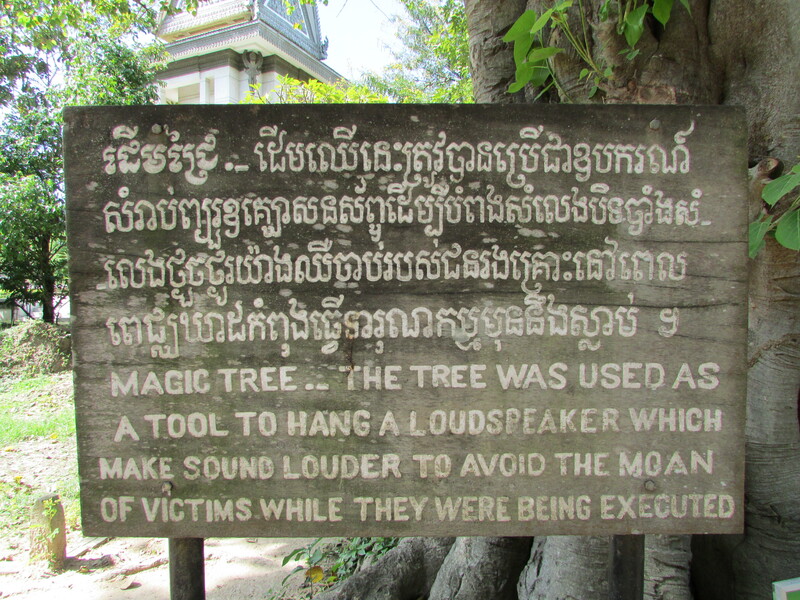 But in some respects worse was to follow, when we drove back to Phnom Penn to visit Tuol Sleng/S-21, the torture house and prison where many victims found themselves before being transported by truck to the Killing Fields. 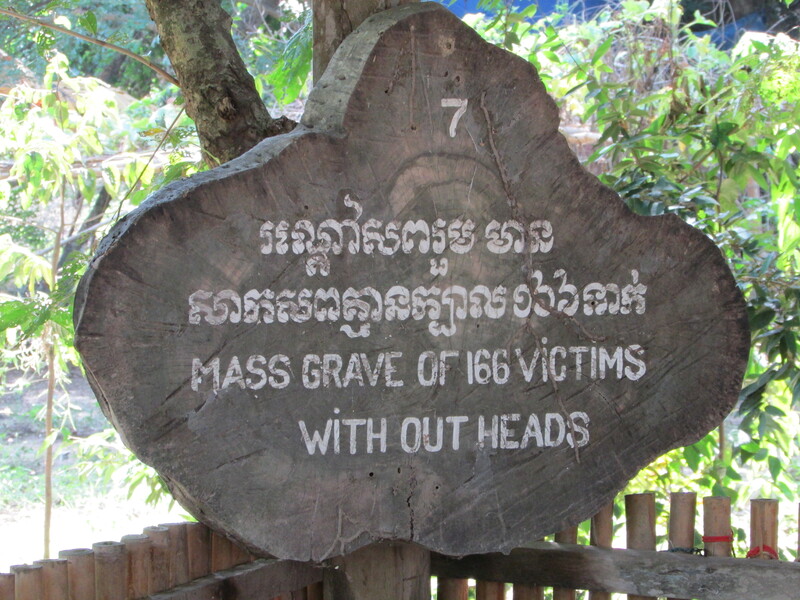 Sixteen thousand were housed there, tortured and murdered by “brain washed” guards who were typically aged between 15-21! Yes, you read right, just 15 to 21. 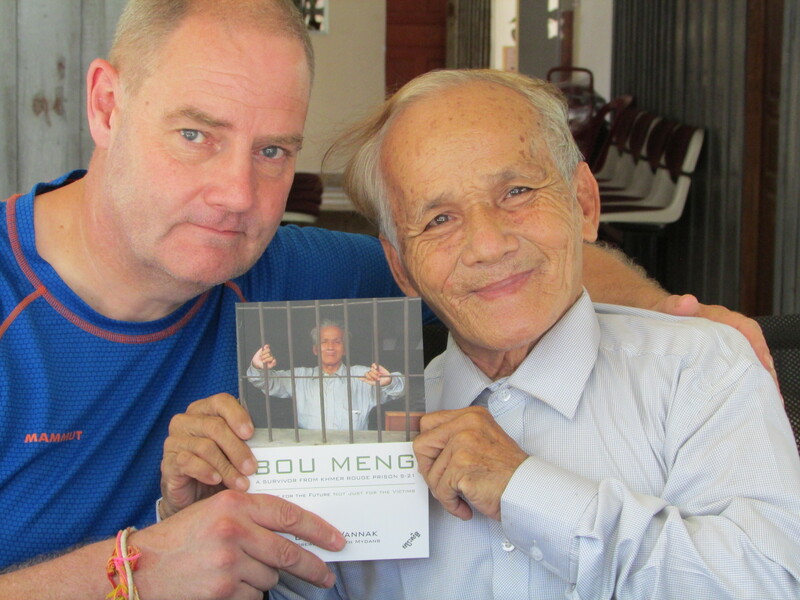 Amazingly I met Mr Bou Meng, one of two S-21 inmates still alive today, two of seven survivors from over 20,000 victims. 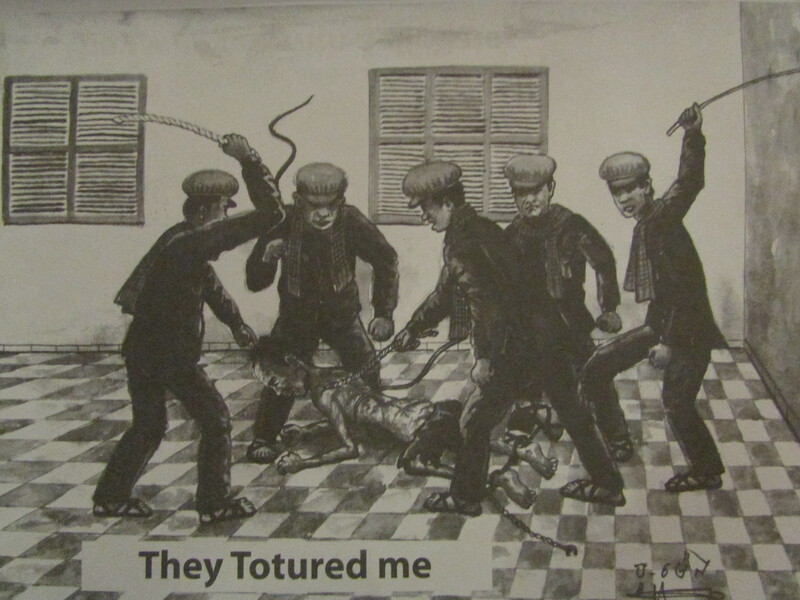 I bought his book and show shots below of his torture that he subsequently painted. 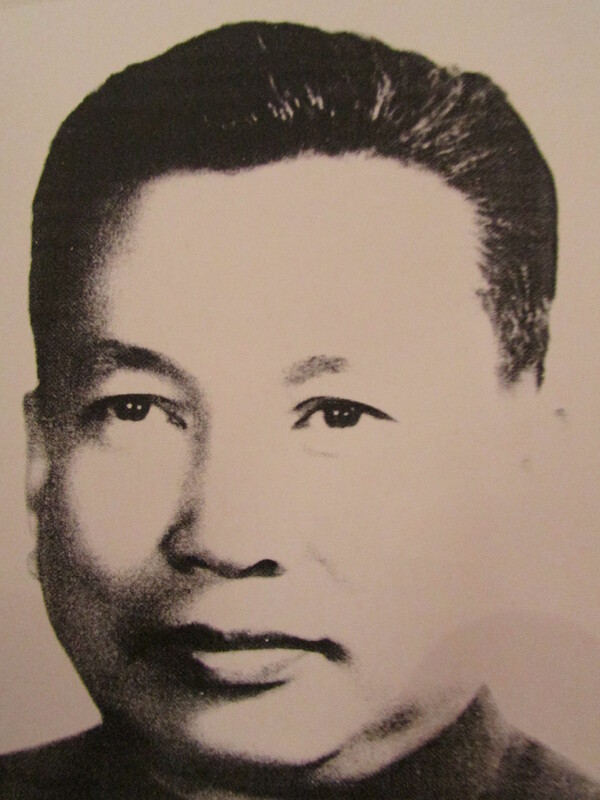 But look closely at the photograph of Pol Pot. This is NOT a photograph of a photograph, but Mr Meng’s pen and ink painting. His great skill kept him alive…. Today Cambodia is a country in transition, but speak to people off the record and they are highly critical of their “elected” Government. From my understanding the last election was far from free. In closing this post may I leave you with a little bit more food for thought as you eat your beans on toast or spider with chips this evening. Would you be happy if the man who was your current Prime Minister and who had been in power for over 25 years just happened to be a former Khmer Rouge Commander? The future – in his hands! 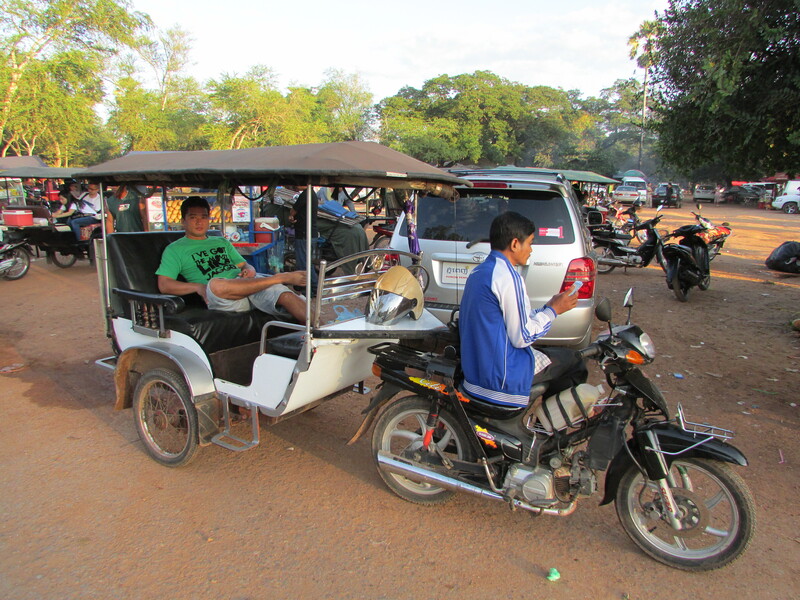 Khmer leaders need to learn to stop the infighting and unite to build a better nation for the people. Leaders put their own personal interests ahead of the people when they do not make an effort to compromise for the sake of the nation. 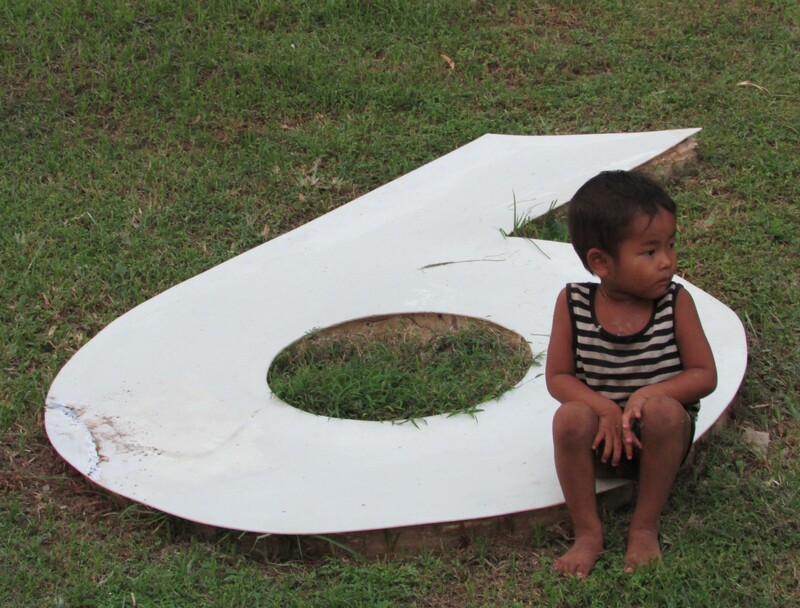 This is all too typical of the Cambodian politics and history. Sarah, hoping that you have turned the corner and are now up and about. Nothing worse than being ill and away from home. Five days is too long to be out of sorts without worrying. I am guessing – or should I say hoping, that you have had to make choices between going on the planned trips with long and grueling days (as ably described by Mark) and taking it easy and getting properly better and fit for the rest of the trip. Thinking of you and willing you better – hope it helps! By the way Saturday was a bit of a Frome reunion – meeting Alison Barrow at Leonora Nutley’s wedding in Luton! – must be the first time I have spoken to her (or should I say she to me) in 50 years! Keep drinking the boiled water and Mum always made us eat nothing but dry toast or cream crackers for days! Hi Mark. Another excellent write up even if the subject is horrific. Are some people just born bad? I really hope Sarah is Ok. Please give her my love and hope she is back in the swing of it soon. Mmmm….not sure I can read this at the moment- just the pictures are shocking enough…..
You have brought it much closer and clearer than any book or printed piece or even television and film. Can’t believe the horror on the one side and then the, call it pragmatism I guess, of Mr Meng and Mr Ran on the other. We hope that Sarah is getting better as it is a long time to be ‘out of sorts’. Keep off that whiskey Mark! Rendered almost speechless by yet more accounts of historical but personal memories of violence and rather large spiders! And Sarah, get well soon. Get well soooooon Sarah. Golly have you called a Doc? The thoughts, the people keep on getting deeper and deeper. Travel safely.